In this article we will go over how to create your BEO template. Couple of features that make our template different from other softwares is that you can have more than one template and the templates comes pre-defined with fields but they can be changed. Note to see what the BEO template looks like filled out please watch the video (link above) or see our article with a completed BEO template. We did not add examples to this article to keep from confusion. 1 - Click on the Admin tab and scroll down the to Global Setting section and click on the BEO bubble and click on the BEO Templates link. 5 - Your BEO template will then appear on the next page with information predefined sections. 6 - All sections can be moved to appear in a different order. Just click, hold and drag the section to change it's position. 7 - Under each you will find icons that will allow you to change the way the field looks. 10 - Food and Beverage section is pulled from the food ordered on the ticket. 11 - Time Line: The Time Line section can be pre-filled with tasks associated with a specific type of event. For instance; Kitchen Arrives to Prep, Trucks Loaded, Buffet Set Up, etc. Then once you use that section of the template, you will complete the start and end times for the specific event. 14 - Rentals section come from the Rentals that were entered on your catering ticket tab. Remember to create this under the Menu Manager link. 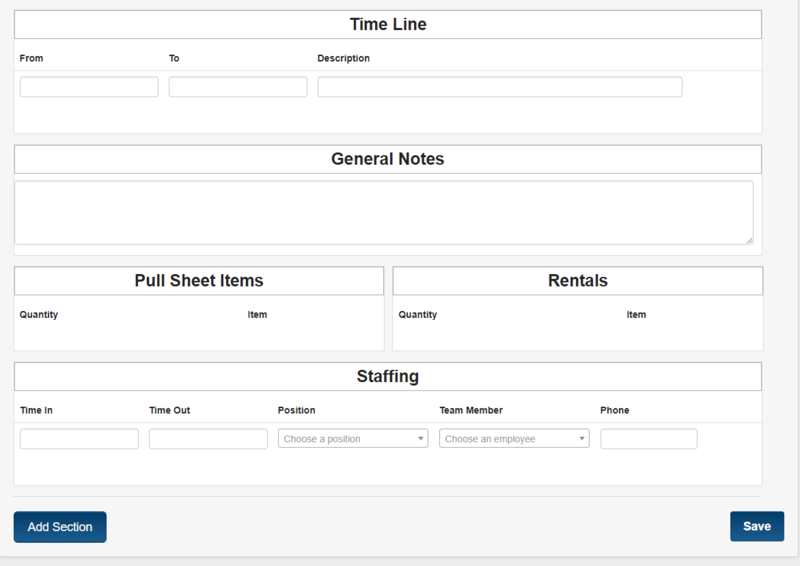 15 - Staffing: The Staffing section can be pre-filled with tasks with team members with staffing positions that you will more than likely have for an event. For example: Catering Captain, two Servers, and one bartender. 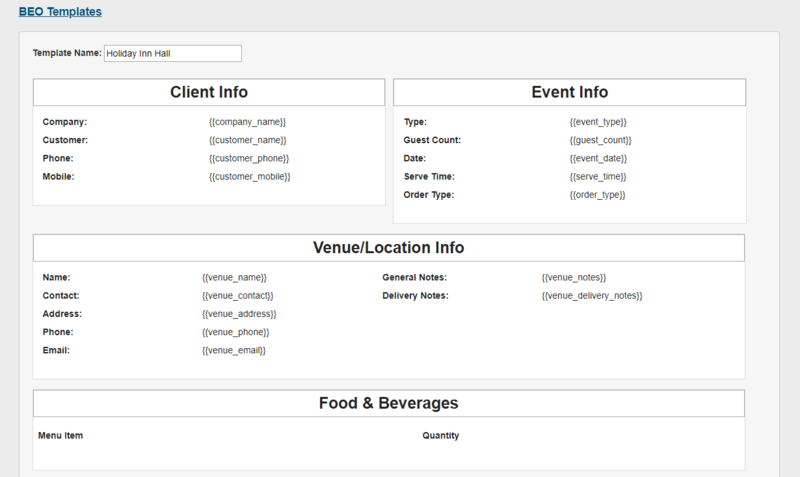 This way when you customize the BEO for an event you will have a starting point for your staff. 16 - Note if there is a section that is not preloaded that you need you can click on the Add Section tab to have a new one appear. Your choices are Extra Section - Signature - Pictures. A - Extra Section - this will add an addition section into the BEO template. So if there is something different that you need for the is particular template you can add. B - Signature - this section will allow you to add your Terms and Conditions. As well as your company signature and date along with the customer's signature and date. C - Pictures - this section will allow you to add pictures that might help the customer visualize what the set up will look like. As well as you can add a picture of the venue. Note - To add an image from your computer you will click on the Drop Images or Click Here link. Then a pop up box will appear and you can choose which picture you want to upload. If you have the picture ready to drag and drop then you will click and hold on the picture and drag and place it inside the box you want it to appear in. 17 - Once you have made all your changes click on the Save tab. Your BEO template has been saved. You have now learned how to create your BEO Template. Note there is a video that will show you how to create a template as well.